If you didn’t check the ‘Enable Restricted Formats’ box while installing Ubuntu 17.10 on your machine, you’ll have to manually install multimedia codecs to make the default Rhythmbox music player and Totem video player play audio / video files. 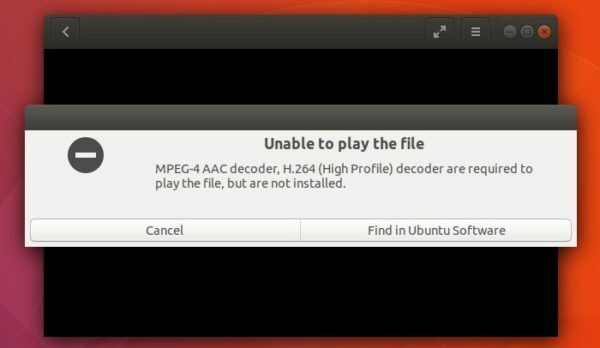 Due to legal reasons Ubuntu can not play MP3, MP4, and other media files out of the box. You can manually install commonly used media codecs via a single package called ubuntu-restricted-extras. The commands automatically install all required multimedia codecs for use in Rhythmbox and Totem, along with some fonts for Ubuntu. Thanks man. I couldn’t do without my music and movies. When I try to sudo the restricted extras package I get an error saying it cannot locate such package. You need to run “sudo apt-get update” before it will work. 1. Search for and launch “Software & Updates” from app launcher. In first tab, make sure the top 4 check-boxes (main, universe, restricted, multiverse) are enabled. Same thing here its stock in the license agreement. You need to press TAB to activate the “OK” button. Not immediately obvious! Thank you so much ! I was lost without music and movies. I want to install media files on my laptop which has Ubuntu OS. Can you explain in laymens terms how i do that please.